The Kilpacker trail is located in the San Juan National Forest and Lizard Head Wilderness Area near Telluride, Colorado. The trail begins off of Forest Road 535 and comes to an end about 3 and a half miles later where it connects to the Navajo Lake trail. At that point hikers can continue along the Navajo Lake trail for another 2.7 miles to reach Navajo Lake which sits in a scenic alpine basin below El Diente and Gladstone Peaks. 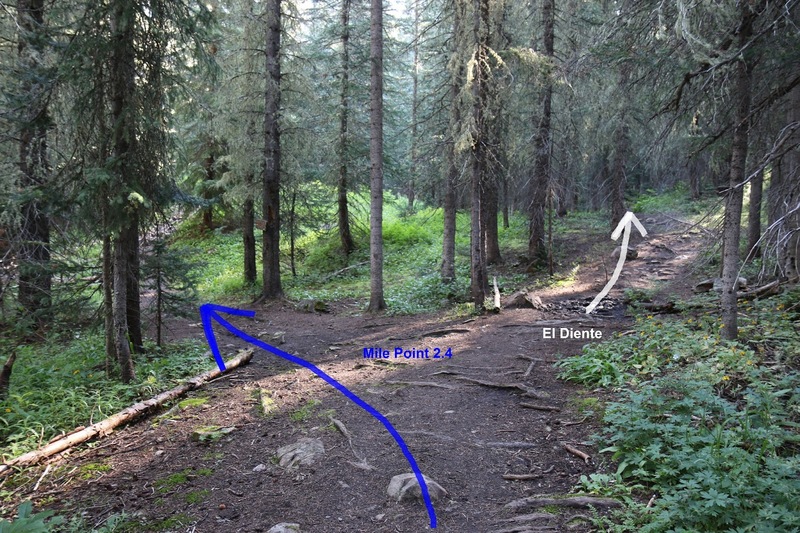 At the 2.5 mile point of the Kilpacker trail the El Diente spur, that climbers use for access to that 14,159 foot peak, begins. 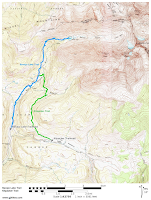 For this post we will describe the Kilpacker trail up to the junction with the Navajo Lake trail. 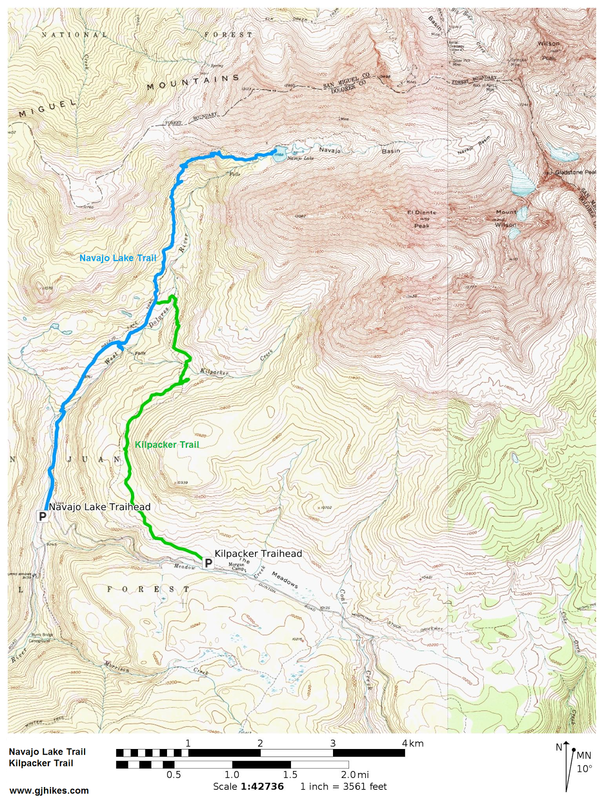 Readers can then refer to the post for the Navajo Lake trail for a description of the rest of the route to Navajo Lake. To get to the trailhead from Telluride drive 16.5 miles, measuring from the roundabout, on Highway 145 and make a right turn onto FR #535 just past MM 54. The road climbs the mountainside along a series of switchbacks where is levels off somewhat after several miles. Stay to the right at the 4 mile point continuing past an area called 'The Meadows' and turn right just past the Morgan Camp at the 4.8 mile point where the Kilpacker Trailhead sign as seen in the picture marks the turnoff. From here it is about a quarter mile to the trailhead in the small grove of trees straight ahead. Forest Road 535 is easily passable by passenger vehicles with normal ground clearance. Be sure to drive slow enough that you don't puncture a tire though. A half dozen or so primitive campsites are available around the trailhead area. When ready for your hike be sure to sign the trail register to make Search and Rescues job a little easier. Who knows, maybe it will also encourage more periodic trail maintenance. From the trailhead the route begins a gentle climb through a meadow above the road where it passes through a small aspen grove and at the half mile point comes to a trail junction where the Groundhog Stock Trail departs on the left for its 1.2 mile stretch between the Kiplacker and Navajo Lake trails. From that junction the Kilpacker trail enters a forest of tall spruce and just past the 1 mile point from the trailhead it crosses into the Lizard Head Wilderness Area. The trail continues in an undulating manner and at the 2.4 mile point it passes the spot where the climbers trail to El Diente departs on the right. There are trail signs at this point so you will know where it is. As the trail continues it crosses Kilpacker Creek and reaches its highpoint just past the 3 mile point where it begins descending toward the Navajo Lake trail. Near the 3.4 mile point the trail crosses the West Dolores River which is fed by Navajo Lake and the surrounding drainage. There are several trees that the nimble of feet can use to make the crossing. Since the water was less than a foot deep we chose to take advantage of our waterproof boots and wade across to the other side rather than risk falling off the log. After crossing the West Dolores River the trail makes its way a little further through the forest and then comes out into the open where it has an easy climb up to where it connects with the Navajo Lake trail and comes to an end about 3.6 miles from where it began. At the Navajo Lake trail junction you have the option of continuing up to Navajo Lake or turning around at that point. It is about 2.7 miles on up to the lake with about 2,000 feet of elevation gain. Turning around at that point will give you a total round trip distance of about 12.6 miles depending at what point you turn around at. The Navajo Lake trail continues around the north side of the lake where it climbs over a ridge to the Rock of Ages trail. For a more complete description, including a slideshow, see the post for the Navajo Lake trail. On the trip back you may want to checkout the waterfalls just below the West Dolores River crossing where the river spills into a small canyon gorge on its trip down the mountain. We took the time to fill our bag with some hawkwing mushrooms on the way back. There were plenty of other varieties that we could have chosen but for this trip we only picked the hawkwing. These are a variety that are easy for beginners to identify. An easy way to prepare them is to boil them for 5 to 10 minutes after cleaning them and cutting them into strips or chunks. We like eating them on salads and in surfer girls tasty mushroom soup. Some of them also ended up mixed with some scrambled eggs and peppers. Most of the vehicles at the trailhead are from people that are climbing El Diente. Backpackers that are headed in to Navajo Lake to climb the other peaks in the Wilson Group usually begin at the Navajo Lake trailhead. From there they have a little more elevation gain but the overall hike is shorter. Hiking to Navajo Lake via the Kilpacker trail is a heck of a trip for a day hike but that is the way that we did it. We hiked to Navajo Lake from the Kilpacker trailhead and along the way we explored part of the El Diente spur and the Woods Lake trail. By the time we were finished we had logged about 14 miles. After that we went down to the Navajo Lake trailhead and hiked that trail up to where it was joined by the Kilpacker trail. Before the day was over we had racked up around 21 miles of hiking. The Kilpacker trail is a nice hike whether you go all the way to Navajo Lake or not but the hike on up to the lake makes it even nicer. If you would like to see it for yourself then all you have to do is 'Take a hike'.